Bullet holes on petroglyphs in Gold Butte. In June, one year after the survey crew retreated, BLM workers finally returned to Gold Butte. “It was not a safe place for (federal workers) to be,” says Jaina Moan, executive director of Friends of Gold Butte, a group that advocates for and provides education about the 350,000-acre swath of BLM-managed desert. Senate Minority Leader Harry Reid, D-Nev., an outspoken critic who has called Cliven and his sons domestic terrorists, has been blunt about the link between the militia atmosphere created by the Bundys and the continuing threats to BLM workers. “Because of trouble caused by the Bundys and their pals, the federal employees tasked with safely guarding these antiquities were prevented from doing their jobs,” Reid said on the Senate floor in April. “These employees have been under constant physical and mental threat for doing what the American people have tasked them to do.” Nationwide, threats against BLM employees shot up 87 percent during 2015, and by 60 percent against U.S. Fish and Wildlife employees, according to a report by the Public Employees for Environmental Responsibility. 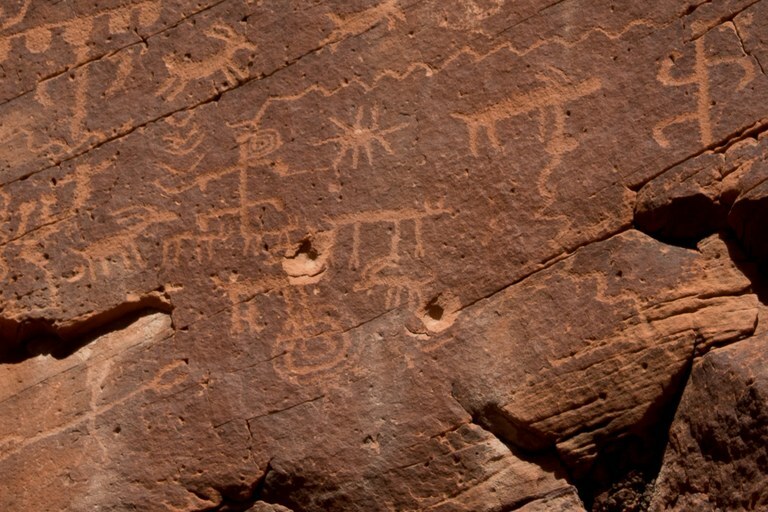 The Gold Butte area suffered vandalism after the Bureau of Land Management pulled out of the area. William Anderson links the fight to protect Gold Butte with a national monument to other struggles over tribal sovereignty. He sees the Bears Ears national monument struggle in Utah, Oak Flats mining of Apache heritage sites in Arizona and the current protests at Standing Rock by Sioux in North Dakota as similar examples of tribes fighting to preserve their culture.